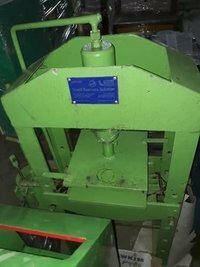 TradeIndia.com- Get online details of leading suppliers dealing in Slipper Making Machines including Shoe Making Machine, Strap Making Machine, Shoe Wrapper Machine. They are productive and cost effective for slipper making industries and factories. Small Business Solution is a notable Exporter, Manufacturer and Supplier of Paper Plate Making Machine, Dona Making Machine, Fully Automatic Paper Plate Making Machine. Looking for Slipper Making Machine ? Slipper Making Machine is an industrial use machine made from aluminum and steel. It is used in the production of fashionable and high end slippers having a smooth finish and comfort. Slippers are loose and lightweight footwear for casual wear. They are worn at home and for not much far distant. They are made of soft rubber and PU material. However, there are different types of Slipper Making Machines designed in differing sizes and specifications with differ frequency, weights and power consumption capacity. Their weight sizes may vary from 40 kg to 3000 kg. And, their capacity to produce the slippers may vary from 150 to 180 pairs, 230 to 300 pairs ,800 to 1000 pairs per minute, 3500 pairs in 8 hours. TradeIndia.com is an one-stop source for buying the fantastic quality of Slipper Making Machines online from calibrated suppliers, dealers, traders and exporters. Apart from the above, you can also browse our comprehensive listings of Shoe Making Machine, Strap Making Machine, Shoe Wrapper Machine and more products for seller listings, best rates, and bulk buying. It allows to compare several different wholesalers, traders, dealers, and exporters of slipper making machine on a single page for shortlisting. Once you've shortlisted the Footwear Machinery suppliers, you can contact them through email, SMS or by using Call Me Free services. Q.1 What is a Manual Slipper Making Machine? A Manual Slipper Making Machine is a less bulky and industrial use machine with mild steel body. It is manually operated to produce the many pairs of slippers. It has 2 horse power of motor to do its task. However, its productivity is less if compared with the Automatic Slipper Machine. Q.2 Where are Slipper Making Machines are made available in India? In India, Slipper Making Machines are widely made available in the cities including Kolkata, Ahmedabad, Kanpur, Pune, Ranchi.